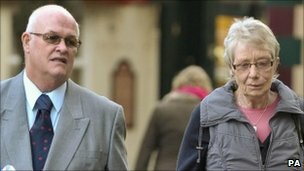 Children at a former Jersey care home were subjected to a catalogue of abuse by their house parents, a jury heard. One former resident of Haut de la Garenne told the Royal Court she had her head held in a pool of urine. Other witnesses told the court they were punched for slouching, locked in a cell, and had soap forced into their mouths for swearing. Morag and Anthony Jordan, both 62, from Kirriemuir, Angus, deny assault charges dating back to the 1970s and 80s. The alleged victims, now aged in their forties, claimed they were victims of a routine of violence inflicted by Mr and Mrs Jordan. One woman, who was placed in the home due to family problems, described how she was kept in a "cell" and had her face rubbed into a puddle of urine overflowing from a potty. She told the court she was taken to the detention room by Mrs Jordan after running away from the home. The former resident said: "I was screaming, I wanted out. Because I had weed over the toilet she wouldn't let me out. "She placed my head in the urine - she wouldn't let me out." It was one of many instances of abuse, according to the woman. On other occasions she was force-fed and made to eat food she had spat out, the jury heard. The former resident told the court Mrs Jordan, known by her maiden name of Kidd at the time, "scares me and she still scares me now". Another woman, who was about 14 years old when she was at Haut de la Garenne, told the court Mrs Jordan treated her like a "piece of dirt". She said the defendant humiliated her because she wet the bed and "used to pull my face into the sheets and let the other children know what I had done". Another former resident gave accounts of having soap forced into his mouth by Mrs Jordan. He said: "The bar was right in, I felt if I didn't bite it, it would slip down my mouth." He told the court he was hit on numerous occasions by Mr Jordan. Defence advocate Michael Preston claimed both witnesses had exaggerated and lied about the events. He accused the first witness of blaming Mrs Jordan for all of her difficulties as a child, both at the home and within the family. But she said she only blamed Mrs Jordan for the things she did to her at Haut de la Garenne. The witness said: "We were put in there to be loved, not to be treated like that." Mrs Jordan, who is originally from Dundee and worked at the home from 1970 to 1984, is accused of 36 counts of common assault involving 11 children aged between one and 17. Mr Jordan, who joined the staff in 1978, faces 12 charges of common assault involving two children aged eight and 16.